[VINNE, Jan Jansz. van der]. [Lekzigt near Dordrecht?, 1780?]. Watercolour on a half sheet of laid paper (42.5 x 27.5 cm), mounted on wove paper. In a passepartout. 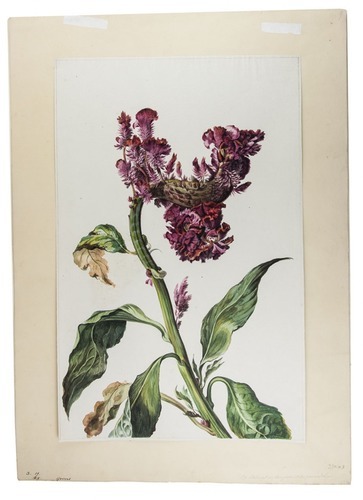 Attractive watercolour drawing of a cockscomb (Celosia cristata), a plant with bright ornamental flowers native to the Asiatic tropics, with a diverse herbal use, cultivated in European gardens as early as 1570. The drawing is not signed, but can be easily attributed to the Dutch flower painter Jan Jansz. van der Vinne (1734-1805), one of the members of a family of notable artists. The watercolour has a 19th-century(?) inscription in pencil on the back: "Op Lekzigt in den Jare 1780 gewasschen" (Grown on Lekzigt in the year 1780), indicating that the plant illustrated was grown in 1780 in the gardens of Lekzigt, a country house near Dordrecht, likely owned by Aarnout Gevers (1714-1788), alderman of Rotterdam, as his wife Margaretha Maria Brouwer died there in 1784. The old index number ("3.11.65 Gevers") also indicates it belonged to a member of the Dutch Patrician family Gevers, all known collectors. Dozens of botanical drawings by the Van der Vinne family ended up at a Christies auction in 1989, but it didn't include our present drawing. This sale did include four other watercolours by Jan Jansz. van der Vinne, each with a Gevers reference number very close to the present and three with the same C & I Honig countermark. A 5 cm area of the paper's surface has been scraped away and part of one leaf of the plant has been painted over it. Further in very good condition. Cf. Christie's, Dutch, Flemish and German drawings (Amsterdam, 21-11-1989), 126-129; for Gevers: Engel, Alphabetical list of Dutch zoological cabinets and menageries, pp. 93-95.